BRYAN EATON/Staff photo. Under a portrait of the Dalai Lama, Ven. 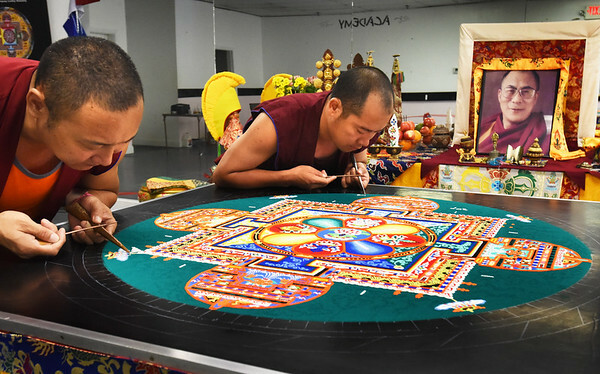 Tashi Phuntsok, left, and Jampa Norbu create a sand mandala with two other monks from the Drepung Loseling Monastery at Unity on the RIver in Amesbury which is hosting the Mystical Arts of Tibet throughout the week. They and two others will be working on the painting today and Friday from 11:00 a.m. to 7:00 p.m. which is open to public viewing. The closing ceremony will be in the dedication garden behind the church Saturday at 4:00 p.m. and is open to the public where the painting will be dismantled and toss in the Powow River.